Preface: The following instructions are not meant to be a scientific treatise on Clivia. There are many great Academics who have written far more on the subject and in much greater depth. If you want to know more technical information or make a study we recommend that you seek out other experts and publications. We have merely written this section to assist our Customers using simple and straight forward language and instruction. Thank you for understanding our mission. Clivias are an evergreen plant grown both for their foliage and their flowers. This section is primarily for the Clivia Grower who maintains his or her collection in a set of pots. Before we begin, keep in mind that in warmer parts of the world Clivia can be grown on sides of buildings, in forests or under shade cloth providing approximately 80% of the light is diffused away from the plant. Hard or compacted soils are taboo. If your plant won't fit into a pot-either trim back the roots or use a larger pot. Remember if trimming the roots, apply a fungicide paste (50% fungicide-50% rooting hormone) and do not water for several days allowing the roots to "heal". We use a light, airy mix purchasable here that allows water penetration and excellent drainage. You also want some organic matter in your mix as there are benefits as it breaks down. 20% medium coconut chips; 30% fine coconut chips; 10% composted vegetative material only No Manure of any kind. ; 20% coarse perlite (sponge rock); 10% agricultural charcoal or Hygroton clay pellets; 10% new zealand (or equal) sphagnum moss. The percentages are estimates. Anything close will do. Sometimes we will try different materials, or something might get potted in one of my orchid mixes, which has, Clamshells, Lava Rock, sharp builder's sand, and other items in it depending on plant type. Over time I have come to use a medium cement mixer tray found in places like Lumber yards, Home Depot etc. for a mixing and holding container. Keep your mix dry. Only water after potting up. Clivia readily accept a PH of neutral (7.0) to slightly acid 6-6.9. Unless you have hard alkaline water I wouldn't pay too much attention to PH. Many people kill both fish and plants by making adjustments to PH too quickly. Make changes slowly over several weeks if you must... and buy a good PH meter-no guessing! (Note, we have a product my son affectionally calls Barry's Special Sauce. We have only recently begun making it as a sale item. Use it once per month in the place of one of the fertilizations. Our plants grow really much faster with our mixture.) Everything any houseplant may need is in the "Sauce"
Once during April I use a fertilizer lower in nitrogen and higher in Potassium and the Phosphates to promote flower growth. See Jack's Feertilizer for example-this is a substitution for the 20-20-20 not in addition. For three weeks we use 1/4 teaspoon of fertilizer per gallon of water (Or 2 weeks Fertilizer, 1 week Sauce, 1 week water only). I make sure the pots drain. No standing water, please. This procedure is carried out whether watering by hand or using sophisticated dosing systems. On the fourth week we use only water and nothing else and fully flush any salts out of the plant. (again no standing water left in pot, please). In Late Winter/Early Spring change your fertilizer over to any good one that has its second number, at least, twice as high as the first. This action will stimulate larger flowers, flower counts and bigger Umbels. Do this until late spring. Remember if in doubt don't fertilize.. In order to stimulate your Clivia to both bloom and especially to encourage growth of tall Umbels (Balls of flowers), you must give them a little winter chill. We place our adults into an area that in general remains at 45-60 during a winter day and drops no lower than 40 degrees fahrenheit at night. Some enthusiasts use higher numbers but we are simply trying to expose what we do to our valued customers. Covered for the most part under watering as water is the vehicle used for the soluable fertilizers. By using the Cal-Mag supplement we are just assuring ourselves that we are not missing any ingredients our beautiful plants may require. I Read on Dudeknowstuff.com that I should use Bat Ear Wax for a media. Why should I use your method? We have nothing invested in you using our methodology. It works for us. If you want to use regular dirt, potting soil, bat ear wax, etc for your media go for it. 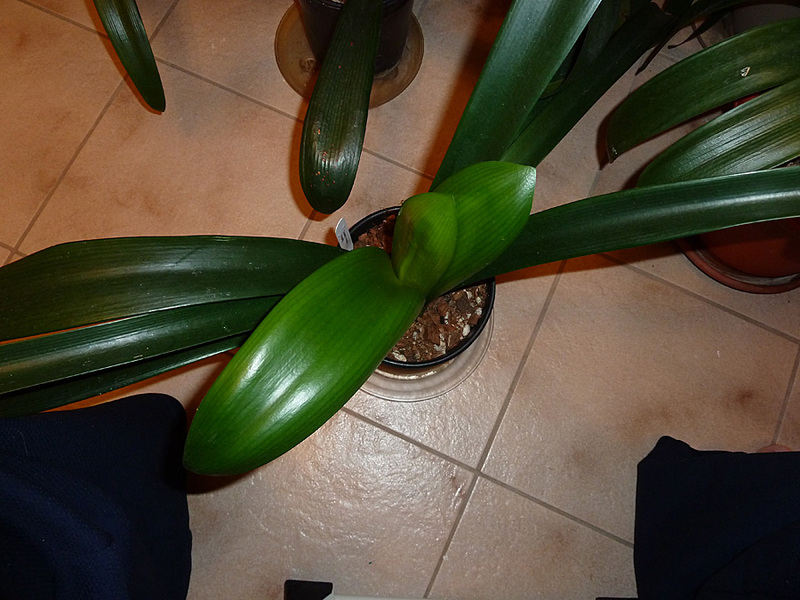 Adult Clivia are TOUGH so they will survive your choices most likely. Just understand theres a difference between survive and thrive, and that difference is sometimes dramatic. For example this is an offset of Conway's Hannah we bought from someone in California who plants in dirt. The plant came in and was a nice healthy strap leaf plant. Only one thing, after a few months here we learned it was not supposed to be strap leaved at all. It had been putting all its strength into survival. Yes the leaves pointed at with the arrows are on the same plant. 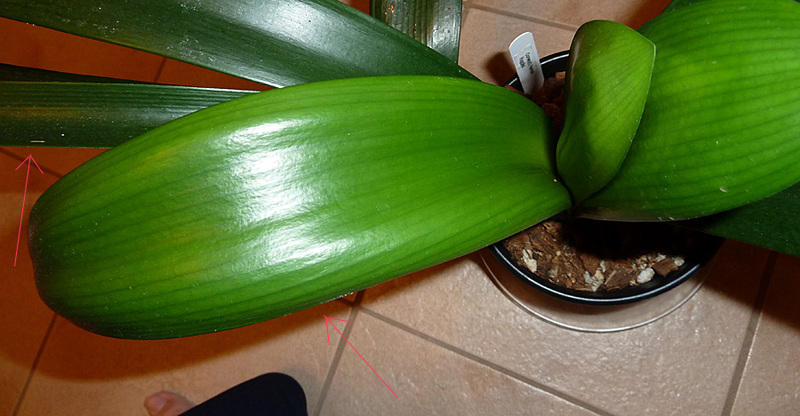 Other info that is not at all related to this article: If you ever need a picture of dead rust on a clivia you can go ahead and use the leaf in the top of the photo too. Our personal plants got hit by a hailstorm this summer so we are pretty happy to have gotten away with just a little rust and scarring. Some people might cut that off or remove the leaf but we feel that if the leaf is still generating energy for the plant and not contagious theres no reason to remove it.